Circuit breakers connect the wiring of each circuit to supply a home's electricity and as such they serve as the gatekeeper of power. In other words, they are the primary safety devices in a home electrical system. If a circuit breaker senses that the circuit is drawing too much amperage, the breaker "trips," shutting off all power to the circuit. In most modern homes, there are a few different types of standard breakers as well as specialty breakers that sense for specific safety hazards. The circuit breaker panel controls the electrical circuits in your home. Circuit breakers reside in your home's service panel, commonly known as the breaker box. (If you live in an old house, your service panel may have fuses instead of circuit breakers.) The service panel is like a switchboard that connects to the utility's power supply and delivers electricity to each circuit in the house. Every household circuit starts at the service panel and connects to its own circuit breaker. When the circuit breaker is on, or open, electricity flows out through the circuit wiring to the various devices and appliances served by the circuit and back to the service panel. When the circuit breaker is off, or closed, no electricity is supplied to the circuit. Circuit breakers have a toggle handle or lever that allows you to switch the breaker on or off manually. A breaker cannot turn itself on automatically, but it can turn itself off. This is called tripping. When a circuit breaker has tripped, turning off the electricity, the toggle is between the on and off positions. 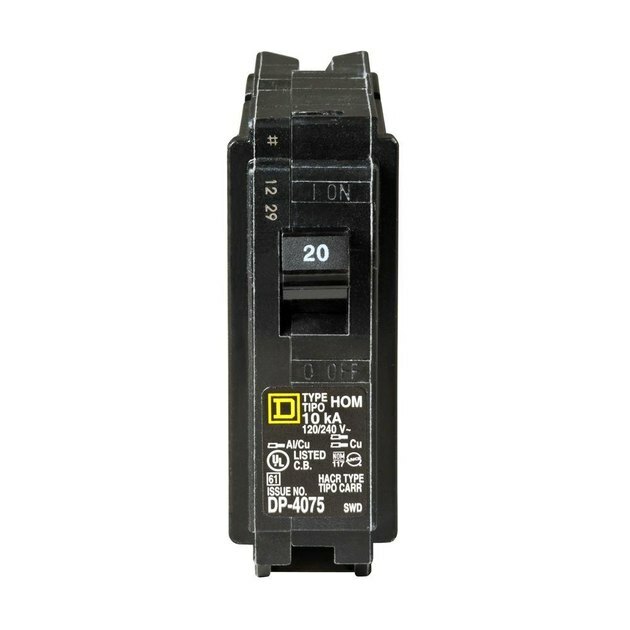 A circuit breaker is a type of overcurrent protective device, or OCPD. Current is another name for amperage, or the rate of flow of electrons in an electrical circuit. (Voltage is the amount of pressure in a circuit). All the wiring and devices on a circuit are rated for a maximum level of current or amperes (amps). Most circuits in your home are either 15-amp or 20-amp, but there may be several circuits with higher amp ratings. Each breaker carries the same amp rating as its circuit. On a 15-amp circuit, for example, if no more than 15 amps of current flow through the circuit, the breaker will stay on (open). But if the current flow exceeds 15 amps—called an overcurrent—the breaker will trip, shutting off the power. Overcurrents are commonly caused by circuit overloads, such as when you plug in too many appliances on the same circuit, or by a short or a fault. A short occurs when "hot" and neutral wires touch. Faults occur when a hot wire contacts a grounded wire or device. Any of these problems would be extremely dangerous without a circuit breaker in the circuit. Electricity flow creates heat in the wiring. The more current flow, the more heat. Circuit breakers react to temperature change and are designed to trip when things get too hot. Overloads demand more current than the circuit is designed to carry, heating up the wiring. Shorts and faults allow electricity to follow an unintended path, creating a spike in current flow and a tremendous amount of heat. In most overcurrent situations, the primary risk is overheated wiring, which can melt its insulation and cause a fire. This explains why a circuit breaker's primary job is to prevent house fires. 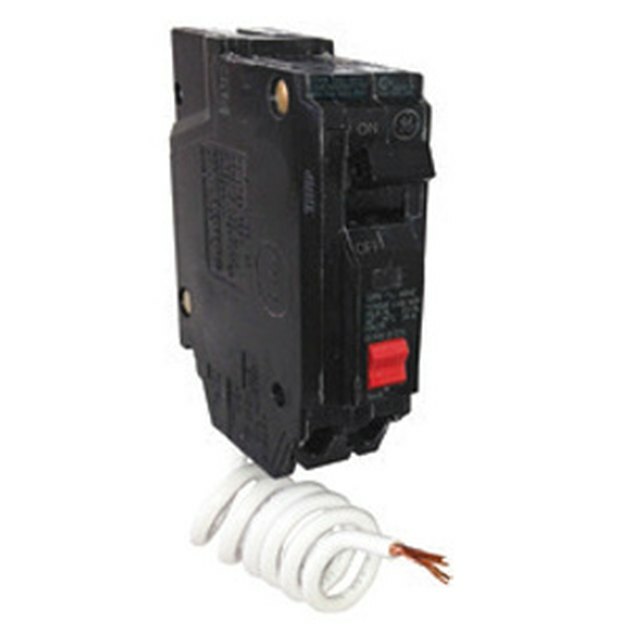 All household circuit breakers are either single-pole or double-pole. Generally speaking, 15-amp and 20-amp breakers are single-pole; 30-amp, 40-amp, 50-amp and higher-amperage breakers are double-pole and typically are twice as wide as single-pole breakers. "Pole" refers to how the breaker connects to the service panel. In the back of the panel, there are two metal plates, called bus bars. Each bus bar provides 120 volts of electricity. When a single-pole breaker is snapped into the panel, it makes an electrical connection with one of the bus bars to supply 120 volts for its circuit. A double-pole breaker connects to both of the bus bars to supply 240 volts. Single-pole breakers supply all of the standard circuits in the house, including those for lighting, outlets, ceiling and vent fans, and small appliances. Each double-pole breaker usually supplies power to a single large appliance, such as a clothes dryer, range, air conditioner, or electric hot water heater. GFCI and AFCI breakers have been around for a while, but many homes don't have them in their service panels. However, they are important safety devices and you are required to add them if you update your wiring system. GFCI is short for ground-fault circuit-interrupter. A GFCI breaker works like a regular circuit breaker but has an added sensing ability to detect ground faults. A ground fault occurs when a hot conductor (a current-carrying wire) contacts a grounded item, such as a grounded metal electrical box or the grounded case of an appliance or power tool. If you happen to be touching that appliance or tool, the current can flow through you. A GFCI breaker senses tiny imbalances in the circuit and shuts off the power to prevent electrical shock. Those funny-looking rectangular outlets with black and red buttons are GFCI outlets. They do the same things as GFCI breakers, but while the outlets protect themselves and perhaps some other devices on the same circuit, GFCI breakers protect everything on the circuit from one location. 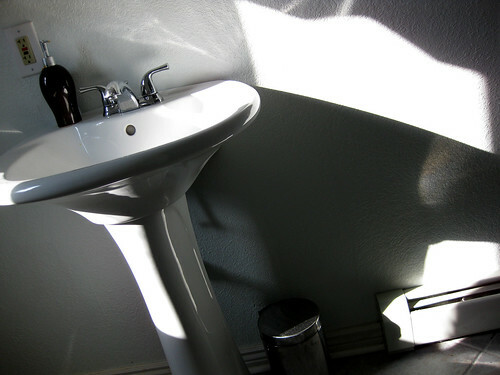 GFCI protection—provided by a breaker or outlet—is required in bathrooms, kitchens, garages, laundry rooms, outdoors, and other potentially wet areas. AFCI stands for arc-fault circuit-interrupter. An arc fault is a type of short circuit created by a hot conductor touching a neutral or ground conductor, or by electricity arching (jumping) across loose or broken connections. Arc faults result in extreme heat that can quickly start a fire. ACFIs are similar to GFCIs but they protect against different hazards. In new homes (and updated systems), AFCI protection is required on virtually all standard household circuits that are not GFCI-protected. This is simple: If you're not experienced with electrical work, the only way to use a circuit breaker is to turn it on or off. Replacing breakers or installing new breakers and circuits is not for beginners. That said, if you have to turn off a circuit for any reason, it helps to know how to identify breakers to match them with the right circuit. Electricians are supposed to note which circuit feeds which part of the house, and they may write the notes in marker on the service panel door, or they may use paper sticky labels (which may have yellowed and fallen off years ago). Look at the panel door first, but if the notes are no more clear than a hieroglyph, you're on your own. Start by looking at the numbers on the breaker toggles. Every circuit breaker has a number indicating its amperage rating: "15" for 15 amps, "20" for 20 amps, and so on. Again, lighting, outlets, and fixtures in living areas usually are on 15-amp circuits. Outlets in kitchens and garages, and those for non-portable appliances, such as refrigerators and microwaves, usually are on 20-amp circuits. Clothes dryers and water heaters usually have 30-amp breakers; electric ranges typically have 50-amp. Flip the toggle to switch the breaker on or off. To turn off a breaker, switch the toggle all the way to the off position. To turn it on, switch it all the way to the on position. To reset a tripped breaker—indicated by a toggle position between on and off — switch the toggle off then on. Note: If a breaker trips immediately after you switch it back on, turn it off and call an electrician—there's a potentially serious problem with the circuit or breaker. Do the same if a breaker routinely trips and you can't readily identify the cause (such as a lack of restraint with holiday lighting).